Time to celebrate! REHAB turns 10! And we want to celebrate that with you. That is why we are coming this year with the Limited Legends editions. A collection consisting of Kurts, which have been released over the last 10 years. The name 'Kurt' is inspired by the name of the singer from the band Nirvana, Kurt Cobain. Not only the Kurt got the name of famous rock and pop artists, other shoes from the first collection also got famous names! One pair of Kurts consists of 32 separate patterns. Therefore, a lot of stitching is needed to assemble the Kurt. The sporty back with padding provides comfort and gives the Kurt its sporty, casual character. 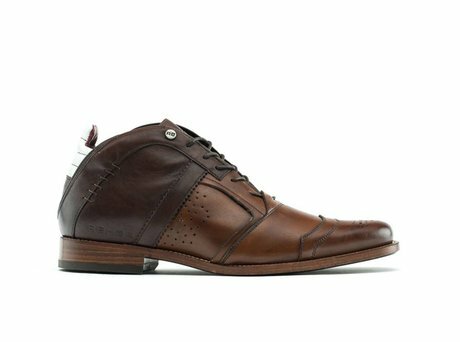 Ontvang direct een e-mail zodra de REHAB KURT II BASIC LL COGNAC-DARK BROWN op voorraad is in jouw maat.